To not let these pics go to waste, I decided to post my before and after pics. This is me pre-makeup and this is after. 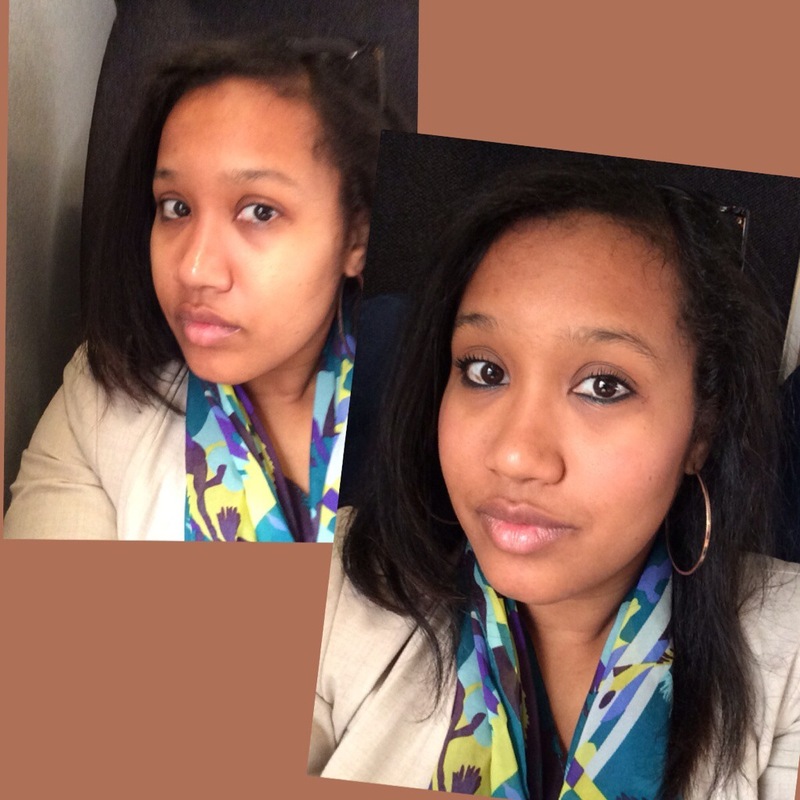 This make-up was done on the Northeast Regional Amtrak train. I tell people all the time my daily makeup routine is 5 minutes, and literally can be done in a car (since that’s what I do every day en route to work). I sometimes use a concealer .. I have been trying various drugstore brand mascara. Currently I’m using a NaturalLuxe from Covergirl that was given as a gift. I tend to steer towards Maybelline, but if I go into Walgreens or CVS and L’Oreal is on sale, that’s who I buy. I tend to go with a lengthening or voluminous one. I try to catch all buy1get1 50% off sales. For a night on the town when I want lashes that can kill, I will use some of Lancome’s eye lash primer. During the work week I’m not a big lipstick wearer, I tend to stick with balm. Also, some might cringe at my lack of “snatched” eyebrows. I can show you a #ThrowbackThursday to when I used to get them waxed and they were AWFUL! I looked like a chola! So I embraced my natural brows… I don’t do much of anything to them but brush them on occasion. However, I want to get into a brow kit. Either Benefit or Anastasia, suggestions? What’s your daily makeup look? Do you tend to not wear makeup or go for a more dressed up daily look?